Of late we've seen a plethora of low-cost Android tablets hitting the Indian market. Micromax, Zync and HCL are some of the manufacturers who recently launched their Android 4.0 ICS-based budget tablets in India. Another India-based manufacturer, Karbonn Mobiles is now eyeing the tablet segment and is going to launch a seven-inch Android ICS-based tablet very soon. The company has already started pre-booking for the device. Karbonn's forthcoming tablet, dubbed as Karbonn SmartTab 1, features a 7-inch capacitive touchscreen along with a 3D gravity sensor for better gaming experience. It runs on Android 4.0.3 OS and is powered by a 1.2 GHz processor. The device also has a mini HDMI port (to connect it to a TV), a micro SD card slot for storage of up to 32 GB, and also a USB port. The The Karbonn SmarTab 1 also comes with a 2MP camera and 3,700 mAh battery. To know more about Karbonn's SmartTab 1, click here. Karbonn's forthcoming tablet is likely to belong to the budget tablet segment, and will take on the likes of Micromax Funbook, Zync Z990 and HCL ME U1Tab. 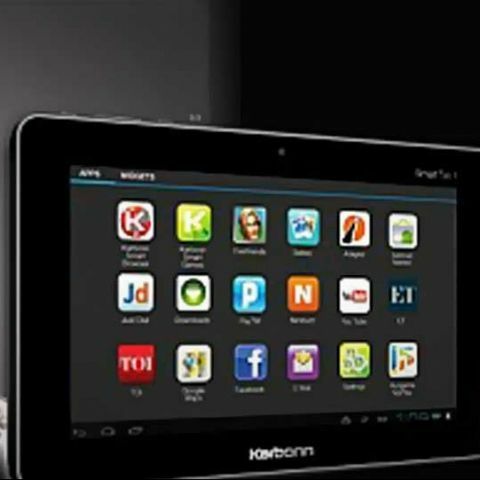 Separately, Karbonn Mobiles will soon launch two entry-level budget Android tablets – A7 and A9. While details of the forthcoming Karbonn devices are sketchy, it's learnt that both the devices will come with dual-SIM functionality and will have capacitive touchscreen. While the A7 will have a 1,420 mAh battery, the A9 will have a better 1,600 mAh battery. No announcement for android L on 15th September? Is Digiflip tablet is upgradable to Android Kitkat?